This recipe makes a dozen individual servings, but you can easily make adjustments to prepare this dish for more or less people. Cutting off the bottom ends allows each squash "bowl" to sit flat in the baking dish and on the dinner plate. Place squash cut side up into a large baking dish (you'll need two dishes if making enough for 12 people or more). Season squash with salt and pepper and sprinkle sage evenly over all. Pour the broth into the dish. Place the garlic cloves around and between the squash. Cover the dish with foil and bake until squash is fork tender, about 50 to 60 minutes. Remove the squash from the oven and set aside. Turn the oven to broil. Remove the garlic cloves from the dish with a slotted spoon. Using a fork, mask the garlic in a small bowl. To this add 2 tablespoons of the pan juice and the heavy cream and stir. 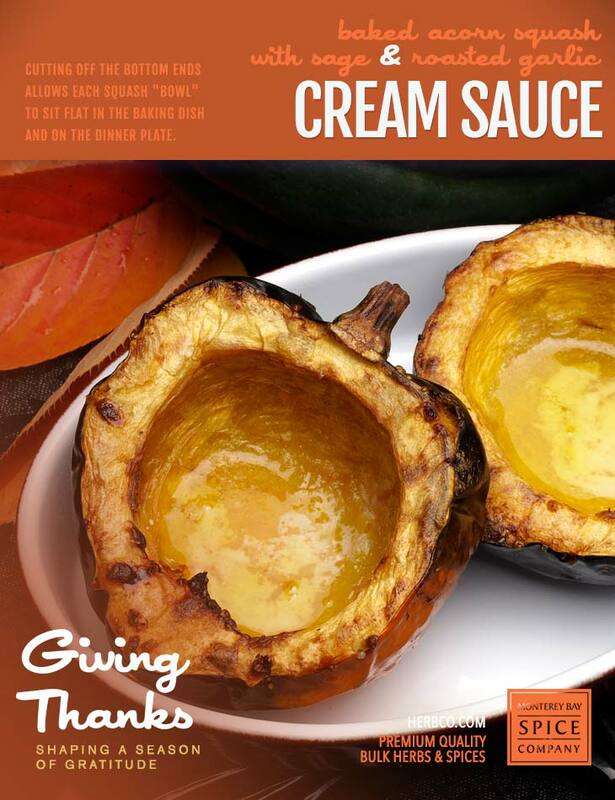 Using a spoon, drizzle this sauce over the squash. Broil squash about 3 minutes or until golden brown and serve.